REDSTONE ARSENAL, Ala. -- "In the future, Army forces will face adaptive enemies and adversaries that employ a mix of traditional, unconventional and hybrid strategies to threaten U.S. interests. The future operating environment will be uncertain, complex, highly-competitive and politically volatile. Army forces must be designed, equipped and trained to think, access, combin and employ capabilities across all domains," said TRADOC Pamphlet 525-3-6. 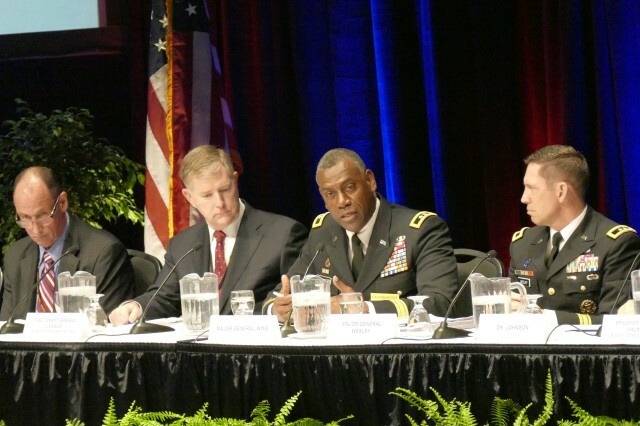 With that in mind, Maj. Gen. Cedric Wins, Commanding General, Research, Development and Engineering Command spoke on a Maneuver Force Modernization Strategy panel 15 March at AUSA Global Force Symposium & Exposition at Von Braun Center. Other panelists included Maj. Gen. Eric Wesley, Maneuver Center of Excellence Commander, Brig. Gen. (Ret.) Peter Palmer, Dr. David Johnson, Center of Strategic and Budgetary Assessments, Kevin Fahey, Cypress International, and Lt. Gen. (Ret.) Robert Lennox, General Dynamics. 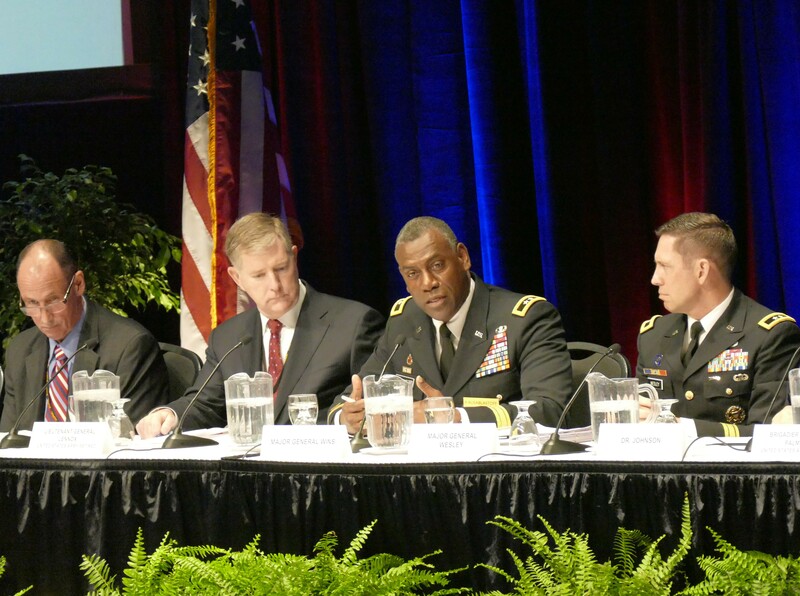 Panelists presented the future maneuver force capabilities based on the Army Functional Concept for Movement and Maneuver and Army Operating Concept. They described how Army maneuver forces generate overmatch across all domains, the electromagnetic spectrum, information environment and human perception. They described how Army forces project power across strategic distances and then transition rapidly to cross-domain maneuver, and how maneuver formations at echelons above brigade contribute to shaping operations and the close fight. Each panelists was given an introductory time period to state their view points. Wins used his time to brief on three points he has learned in his first eight months as RDECOM CG. His first point centered on collaboration. He stated the Army partners not only with industry but with international partners and academia. He made the distinction that although there are many substantial venues promoting collaboration, organizations are not viewing it that way. "This is not a competition," he emphasized. "As the Army's arm for research and development and science and technology we are dependent on [partners]." While stressing the importance of transitions Wins said, "We have transitioned well in some areas but not in others." In areas where Army technologies are strong the transitions run smoothly. In areas where Army technologies are moving from new to programs of record there is more of a struggle. "There are some challenges that need to be worked out," he said. His third point highlighted prototyping. "Prototypes means setting up conditions and looking and seeing what is possible. Asking the Warfighter what is their need," Wins said. Fahey agreed with Wins on this point. "Often we involve the Warfighter too late in the process. We should ask them to be involved from the start. Not wait until testing." The U.S. Army Aviation and Missile Research, Development, and Engineering Center is part of the U.S. Army Research, Development and Engineering Command, which has the mission to provide innovative research, development and engineering to produce capabilities for decisive overmatch to the Army against the complexities of the current and future operating environments in support of the Joint Warfighter and the Nation. RDECOM is a major subordinate command of the U.S. Army Material Command.